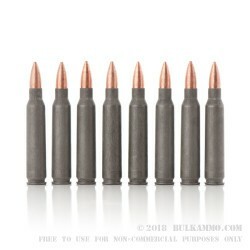 For the money it’s hard to beat a .223 Remington round that is capable of sub 2-MOA accuracy and offers a potent delivery of speed and energy on target in such a versatile grain weight. 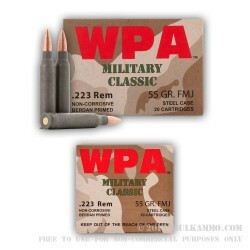 Generally, this ammunition is built to be exceptionally reliable, with the Berdan primer and the quality projectile with a moderate powder charge, which admittedly is a bit dirtier than other mainstream ammunition offerings that cost more. The 55 grain projectile weight is a versatile load with the best stabilization coming out of the middle ground of the production barrel twist rates. This will shoot best out of 1 in 8 inch; 1 in 9 inch and 1 in 10 inch twist rates and is suitable for hunting where your jurisdictional regulatory authority allows it - some jurisdictions require a hollow point with the lower grain weights, and some require all copper, so check your area regulations before using for that purpose. The ammunition in the Military Classic line is very conducive to the types of shooting that most people are engaging in, and beyond those, the round is still quite viable. Target shooting, plinking and hunting are all within that scope; with personal defense and longer-distance plate/reactive target shooting being more outside the dedicated scope, but still within the capabilities of the round. So far the it seems to do the job on the targets. Why bother reloading when you can buy at this price? I bought a box of 500 on sale last month and had no issues with them. 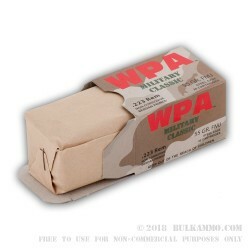 They don't hold as tight of a group as higher end American made ammo but feed just fine and fire every time. Great for range plinking! A: Hello Jeff! 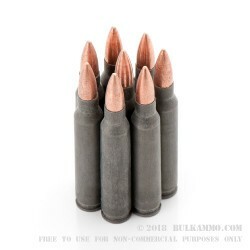 This ammunition is loaded with a bimetal bullet and will be attracted to a magnet. Q: What is the velocity of this Wolf .223 55grain FMJ ammo? A: Hello Mike! 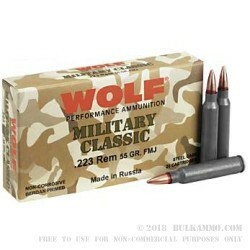 The velocity of the Wolf 55 grain .223 ammunition is stated as 3241 fps by Wolf. A: Hello, These 55gr. FMJ rounds in .223 by Wolf are non-corrosive. 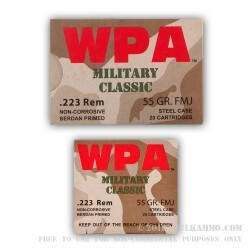 You can fire them in any firearm chambered in .223 without having to worry about corrosive primers.